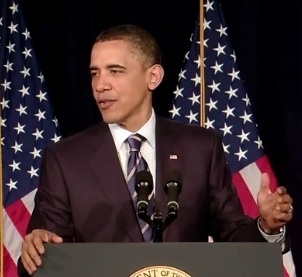 President Obama has announced his plans to eliminate the US budget deficit within 12 years. His timetable is three times slower than George Osborne's. President Obama has finally announced his plans to bring the US budget back to balance. He has chosen to do so on a timetable three times slower than Britain’s Chancellor, George Osborne. Will, I think emulating the US would be admirable. I am sure they will come out of recession faster than the UK as they have a much more flexible economy. You are keen on their planned level of public spending and approach to higher rate taxpayers but since I don’t have the figures to hand would you mind reminding me (and your readers) what the % of US GDP spent by the public sector is and what the top rate of tax is – Would I be wrong to assume from your post that you think they are a good target for us…. Politician in “throw money at electorate a year before the election” total non-shocker. Come 2013 Cameron will be doing the same. Yes but the USA, is the worlds biggest food exportwe. The UK on the other hand, only grows half its food.